This is really a post that would be far better written by Richard North; I happily admit the complexities of defence procurement strategies are somewhat beyond me. But perhaps commentors with experience can add some light or correct any howlers. It seems we are to get our 200 mile economic waters back in a year's time, and with them the right to decide who fishes them and what and how much is caught there. It's also pretty obvious that the UK fishing fleet has been decimated, and it will take time to build new boats and above all to skill new crew in a highly hazardous industry, to upgrade shore facilities including freezing and processing and establish market and inland transport capacity. So it's pretty obvious that we're going to continue to licence, for a suitable fee I hope, at least for some time, both EU and and any other boats to take fish from our waters after 2019. The Fishery Protection Squadron is constantly out at sea around the UK, and has very little, if any time to wander far away from home. A 42 strong crew is embarked to work to a three watches mechanism. Each ship has an additional allocation of personnel used to rotate members of the crew to meet harmony rules. Personnel on the Rivers could be indicatively expected to spend four weeks at sea and two weeks on land, pretty much all year long. The River batch 1 ships each spend a minimum of 275 days out at sea, with maintenance to the vessels intended to ensure the capability of spending up to 320 days at sea. Normally there is a 9 days maintenance period and a longer one of 16 days, each year. Combined, the three ships have to deliver at least 700 days of activity at sea, and Hunt minesweepers are used to complement the Rivers in fishery protection patrol task, but with no fixed target. Back in 2004, some three Hunt vessels could be routinely expected to be involved in supporting Fishery Protection. This is a good point to introduce the Rivers - River class offshore patrol vessels, built in two variants; the Batch 1, which cost about £60m each, and the Batch 2, at a cost of £120m each, which are currently coming off the slipway. 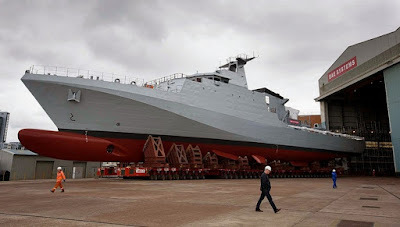 The difference is down to the fact that Batch 2s are being built to warship standards - with systems, magazines etc that can sustain damage and punishment from other warships, whereas the Batch 1s are pure 'constabulary duties' vessels. More on the Batch 2s from Think Defence HERE. Now this is where the lying, double dealing and manipulation come in. These new Batch 2 vessels are also just about suitable as substitutes for the frigates and corvettes that we don't have, to maintain a global presence. But because of their reduced at-sea capacity, they would need to be forward-based - permanently stationed - in the Caribbean, Gibraltar, Falklands or Bahrain - meaning they would not be available for UK fisheries protection. Yet the MoD seems to be pretending that they could do both tasks at the same time. It's pretty obvious they can't. In summary, from next year we'll need a far greater fisheries protection capacity but are building vessels grossly overspecified for FPVs because we need to send them out of the UK. We will not have enough vessels even to maintain our existing FP capacity next year, never mind enhance it. To my simple mind we need more £60m Batch 1s, with a build time of less than a year, that can fly-off UAVs and watch large areas of sea. But we need to place orders now. I can still recall the pages of the Annual from which, as a child, I lay on my stomach on the living room floor reading and re-reading 'The Birkenhead Drill'. This was the story of the formalisation of 'women and children first' back in the 1850s. A troop transport going aground on a dangerous coast, not enough lifeboats, so the regiment drew up on the sinking deck in parade order and watched as their wives and children abandoned ship, facing death and sharks with courage and fortitude. It was one of those youthful lifelong lessons, like never pointing a shotgun at anyone unless you intended to kill them, or saying farewell to a dying pet. I mentally filed this one away; here was my role and duty when I became a man, an English man - to die selflessly with dignity and honour, if required. And certainly not to behave like some cowardly dago or frog. Oh yes I'm serious - this is how we absorbed enduring moral values back then. - Children of unprotected-characteristic non-BAME or non-LBGT parents enjoy no protection and the lowest possible priority in evacuation. We'll have to change the name of course; how about the Rotherham Drill, or perhaps the Telford Drill? At the risk of sounding like a weary headmaster whose rogue prodigy has yet again let him down, I'm very disappointed with Russia. I've defended Russia (whilst happily admitting that Putin really is just a ruthless thug) and still believe that Russia is Europe's natural ally in a global alignment of Enlightened North against primitive barbarous South. Personally, I was even prepared to forgive Litvenenko's murder. But this latest affront is an outrage too far. It's easy to understand why we are the target. The UK is an attractive destination for Russian defectors, ex-spies and refugees from Russomafia thuggery; we have one of the world's best intelligence capabilities, a capable anti-terrorist capacity, a legal system largely free from bribery and corruption and easy access to Europe's best shops. If Russia can make defectors feel insecure in Britain, Putin must think, they will not feel safe anywhere. Economic sanctions against Russia are merely cosmetic whilst Europe is dependent on Russian gas. Russia's breach is not so grave as to demand military retaliation. Something in between, I think, would suit; perhaps a cyber attack shutting down Russian transport, broadcasting or banking for 72 hours would make the message clear. Something of that sort. Without any direct link to the UK yet clear to Putin from whom the retaliation came. Wise comments and Tillerson's sacking have led me to believe I've made a right arse of this, and that Russia's guilt is very much more remote than I've assumed above.